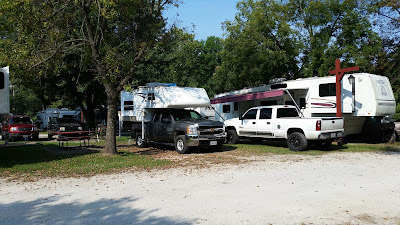 Continuing southwest from my stay on the Mississippi River my original plan was to spend labor Day weekend boondocking on Winkle Creek which is near the tiny Missouri town of Kissee Mills. I got the idea to camp there from Freecampsites.net while ignoring the warning on the review page that the campground floods in the Spring. Heck, this was September so I didn't have anything to worry about ...right? 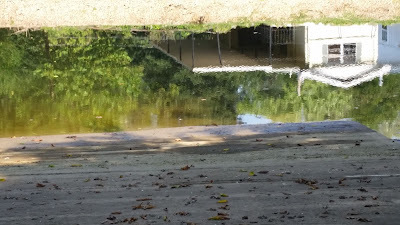 As I was driving by Tuttle Creek Lake, of which Winkle Creek is a tributary, I observed water levels in waterside parks that had one-story buildings almost completely covered with standing water. So when I finally got to Winkle Creek, with the exception of 50 feet of entrance way, everything was flooded out and un-campable. 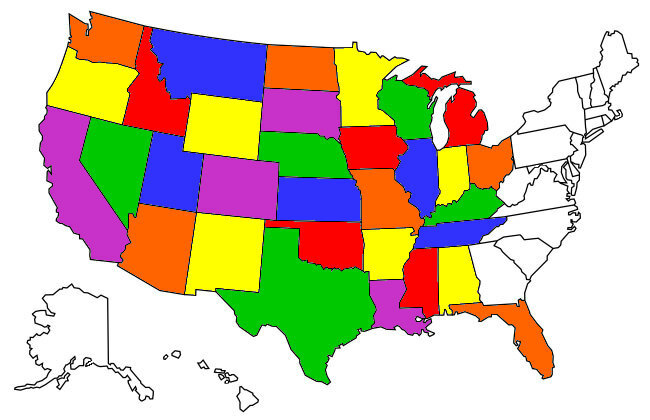 So there I was on the Friday of a major holiday near Branson, MO, a huge tourist destination, where the heck would I get a campsite? I had Google Maps search for campgrounds near me and called the first three....all predictably booked up. Then I remembered that there was an Escapee campground near Branson so I called it. A sight for sore eyes for a needy holiday camper! I was extremely fortunate to get the very last campsite at Turkey Creek Village. While I had hoped to boondock for free that weekend I didn't mind having hookups to run my AC in the hi-90's Labor Day weather in Missouri. Besides, if you're an Escapee member the nightly charge of $19 is pretty reasonable, especially considering a no reservation walk-in on the Friday of Labor Day weekend! 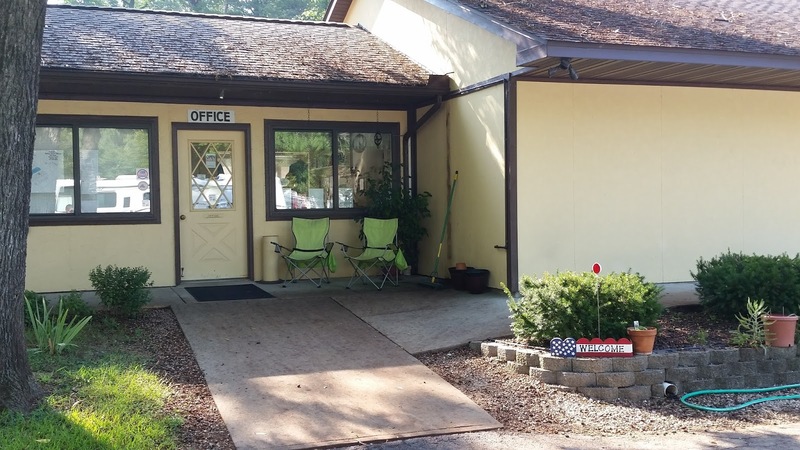 The Turkey Creek office and clubhouse. 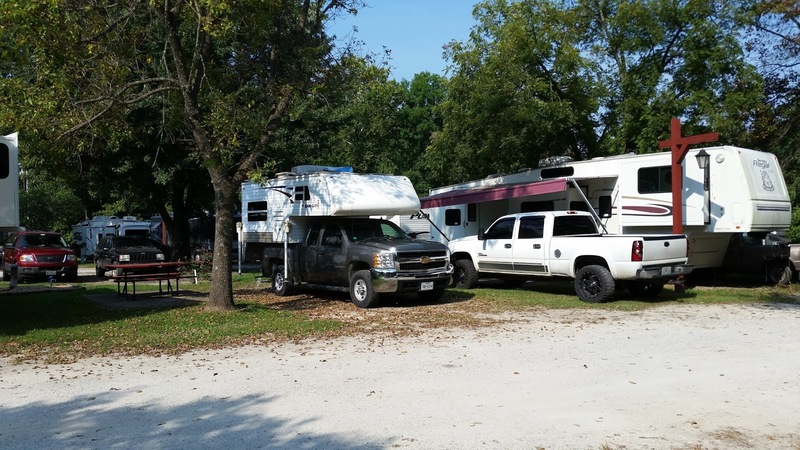 Staying at an Escapee RV park is kind of like staying at a park that is staffed and occupied by your parents and their friends, and I mean that in a nice way. I have yet to meet an Escapee who wasn't friendly and interested in me and willing to talk for 10 or 15 minutes about just about anything. They are just the friendliest bunch of folks you can happen across and all their RV parks that I've stayed in are kept in great shape, as they live there after all. The sites were kind of close together but any port in a storm (or flood). The RV park actually backs up to Turkey Creek (thus the name, duh) which flows about a quarter of a mile into Lake Taneycomo which is a big holiday fishing and recreation destination in the area. Boat house reflected from Turkey Creek seen from the boat ramp. 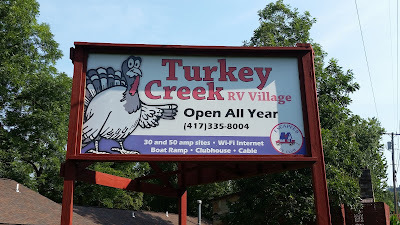 Turkey Creek is only about 20 minutes from the big attractions in Branson and would make a good base of operations for that venue, as opposed to the much higher priced alternatives in the area. There are a lot of activities at the RV park itself too. I was invited to attend and even perform at a Friday evening jam session in the club house and I was also invited to the weekly Sunday evening ice cream social ($.75 a scoop). See, your parents are still fun! Just make reservations!